Old Settler's Music Festival prides itself on being a laid-back, positive, family-friendly experience and their program states: "Please do your part to keep this spirit alive by spreading good vibes. Good vibes means having fun, taking care of one another, having a little patience, and being respectful to your neighbors and staff." And that happens every year we have attended this outstanding music festival. 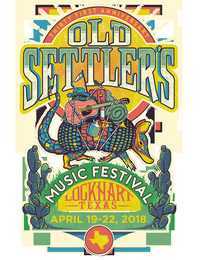 Before you leave our review, check out this page of Old Settler's Music Festival picutres - who knows, you might be included! For the last several years Old Settler's Music Festival has been held in Driftwood at Fort Ben McCulloch campground and the Salt Lick Pavilion just down the road. Old Settler's Music Festival has been so successful that it outgrew the parking and camping facilities. So in 2017 Old Settler's Music Festival bought 140 acres of prime property in Tilmon just south of Bastrop and 10 miles from Lockhart - now you know where Tilmon is!. They divided the property into two large campground areas, the stage area, and several parking areas. A staff of volunteers worked their butts off clearing the land and getting it ready for 25,000 fans that would be arriving in less than six months. The main stage is set up on the edge of a big field across the street from one of the campgrounds. It had lots of room to set up chairs, lay out blankets, or sit on the grass and enjoy the music. It doesn't get any better than relaxing in your lawn chair or blanket, listening to the music, watching the stars twinkle (as well as the colorful lights sparkling in the trees), and the moon glisten. Around the perimeter of the main stage were several vendors offering merchandise (art work, wood work, jewelry, clothes, the performing artists CDs and t-shirts, and more) and a wide variety of very good food ranging from pizza to pita bread gyros to tacos, BBQ, Asian noodles, ice cream, burgers, Philly Cheese steaks, and more - you won't go hungry at Old Settler's Music Festival . Around the corner and a short distance from the main stage was the Bluebonnet stage which was a little smaller and felt more intimate. The campground was home to it's own stage with music on Thursday night, Friday morning, and Sunday afternoon - this is my favorite stage because it's smaller, with lots of room under the trees to listen to the music, it was less than 100 yards to our RV, and best of all you can bring in your own food and drinks! If you're planning on going to Old Settler's Music Festival you might consider getting VIP tickets which offer you free beer, wine and soft drinks, good dinners on Friday and Saturday, and lunch on Saturday. There was a large tent set up between the two stages with chairs and tables for eating, socializing, or getting out of the sun and rain. In front of both stages is a special VIP area to listen to the music. Old Settler's Music Festival created a walkway between the two stages which makes it very easy to get back and forth between the stages. Camp Shh-Times was up a small hill away from the main stage area and the campground (so it wouldn't disturb the campers) and the music started at 1:00 AM and continued to about 4:00 AM on Friday and Saturday night. At Camp Shh-times the bands are completely unplugged and the crowd maintains an attentive, respectful silence. "Raw, powerful, inspiring, energetic performances ensue, forging lifetime memories, and genuine connections between the audience and performers." For over ten years a group of music-obsessed fanatics and super fans known as Team Goodtimes has sought to deliver a unique, intimate, and magical experience for your late night entertainment. By the time 1 AM rolled around, not me, I was curled up in bed and dreaming about sugar plums, maybe in the old days I could have been there! We heard from several people that all of the bands that played Camp Shhh-Times were great and it was a fun night/morning of music. Part of what makes Old Settler's Music Festival fantastic and unique is the diversity of genres which includes bluegrass, folk, country, rock, Zydeco, newgrass, Celtic, reggae, and lots more. And the variety of instruments is amazing - banjos, washerboards, ukulele, trumpets and horns, guitars, fiddles, drums, harmonicas, squeeze boxes, and some other unique instruments unknown to me. Old Settler's Music Festival is a unique opportunity to listen to fantastic and talented musicians - several of which are grammy award winners and nominees with top selling albums. Friday started with Yoga at the Campground Stage followed by 3 bands - Pearl & the Polka Dots, Randy Collier and Grassland, and Paper Moon Shiners. The music on Original Black's BBQ Stage overlapped the Bluebonnet Stage music by 15 to 30 minutes which gives you enough time to listen to a portion of each of the bands on both stages. Because there was music on both schedules, I had to study the program very carefully to make sure that I didn't miss a band and to make sure that I spent a little longer with the bands I thought would be enjoyable - problem was that all of them were enjoyable and it has tough to leave some fantastic music to go to the next stage! I rushed from stage to stage trying to catch as much of each band as I could - by the end of the evening I'm pooped!. Following Yoga at the Campground Stage, the music started on both stages at 11:00. Saturday afternoon from 1:00 to 4:00 there were workshops with Ley Line, Jon Stickley Trio, and Balsam Range. Ray Wylie Hubbard - he's got melodies and stories that get under your skin and stay there like "Snake Farm" and "Red Neck Mother"
Old Settler's Music Festival fans remind me of my days as an aspiring hippie in San Francisco in the 60's! A large majority of the fans are a mix of young new hippies with long hair and beards, there is a faint wisp of marijuana in air, and several aging hippies are dressed in flowing skirts, tie dye shirts, and an assortment of hats. All of the fans are there for good music, good vibes, and fun. They are friendly, outgoing, relaxed, and a joy to hang around with. Old Settler's Music Festival is very kid friendly and there are lots of them dancing to the music and having a good time. There is face painting, workshops, a petting zoo, the balloon man, and lots more. But by far, the most popular was Joyful Bubbles who drove all the way down from Dannville, Illinois to sell his cool bubble wands and let the kids try them for hours - pretty bubbles of all sizes were flying everywhere. So cool we bought two for the grand kids. Another part of what makes Old Settler's Music Festival so much fun is camping within walking distance to the stage, meeting fellow campers, reacquainting with some friends from past festivals, and listening to some excellent picking and singing around the RV's and campfires. Thanks to the new grounds at Old Settler's Music Festival it was much easier to find a place to set up your campsite and spread out under the trees. Generators were strategically placed through the campground for those campers who paid for electricity. Porta Potties and huge water jugs were spread throughout the campground. One of the campgrounds is a little farther from the stage and it has both 50 and 30 AMP service. The other campground is across the street from the campground only entrance to the stages and this campground is home to the campground stage. Both campgrounds are always alive with pickin', singin', and laughter and the smell of bacon or BBQ. You'll find campers and RVs ranging from $300,000 RVs to hammocks, tents, converted school buses, and lots more. Part of the good vibe at Old Settler's Music Festival is generated by the hundreds of volunteers who man the gates, entrances, and the ticket booths, the other volunteers who manage the backstage or make sure everything is good in the campground, and lots of other tasks that make the festival painless for the attendees. But this festival never would have happened in April if several hundred volunteers hadn't worked tirelessly for several weeks clearing the land and getting it ready for the stages, vendors, and campers. Jean Spivey, the executive director, deserves a big round of applause for all of her contributions plus selecting an elite group of musicians to perform. Can't wait until next year!